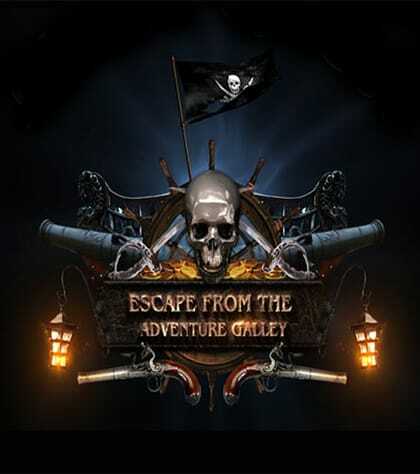 Based on a true to life pirate story, The new Pirate Quest Escape Room is now open at Adventure Zone. Take a look over your shoulder as they close the door and leave the ordinary behind. You have now stepped into another world, a long lost world, aboard the once proud Adventure Galley. Now aboard the ship, you will have one hour to solve the puzzles and hopefully lead to your escape. 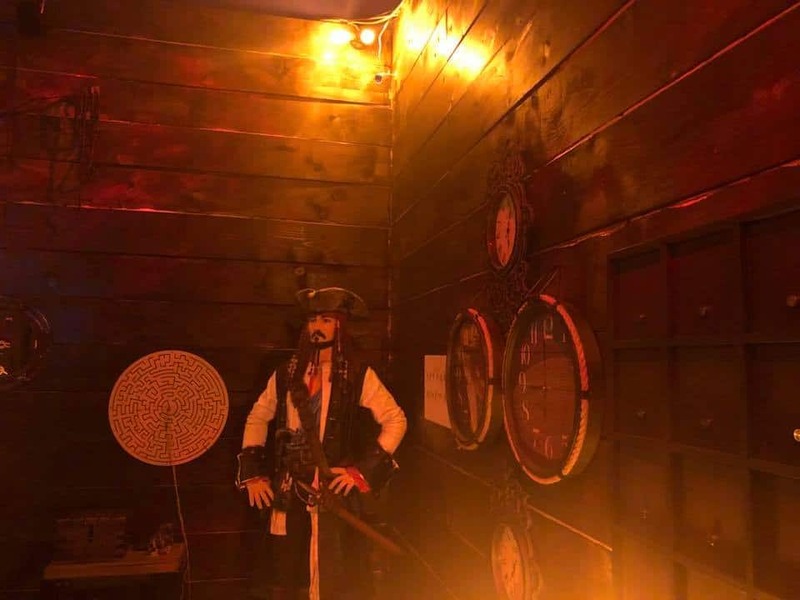 There’s lots of great décor including several life size pirates, elaborate audio and video production, as well as some amazing pirate themed puzzles. It was the year 1695, when the notorious Captain Kidd was commissioned b the King of England to track down pirates for the crown. Being as Pirates were hard to find on the open sea, Captain Kidd turned pirate himself and plundered any ship he could find. The crew eventually mutinied and abandoned ship. Eventually, Captain Kidd abandoned ship himself, and returned to England, hoping for leniency but was promptly tried for piracy and executed. The cursed ship was lost for many a year until our beloved pirates found her and were trapped inside and eventually turned to stone. Your mission is to join our pirates inside the ship, to solve all the puzzles and to escape with your lives before you too are turned to stone and become yourself part of the legend. You will be given a limited number of hints, if requested. You have an hour. The cost is $20 per person. Recommend booking online. Maximum group size 8 people. If less than 8 people, we may group you with others to get to the 8 person group size unless you decide to rent out the entire room which cost $160. Payment is made at the time of the reservation. Walk up business is welcome, but with the limitations on group size, and the length of game play, reservations are recommended. All participants 14 and under require one adult (18+) participant as well. The buy 3 hours for $20.95 and get a free $10 game card and the buy 2 hours for $16.95 and get a free $5 game card are only spring break specials and need proper placement. Yes, you are, however we will have our game master right next door, and can open the door within seconds, if the need arises. While cell phones are allowed in the rooms, we ask you to please turn your phone off and stow it in one of the baskets underneath the bench once the game starts to maximize everybody’s game experience. Unlike most escape rooms, we do allow you to take selfies with the pirates before the game starts and encourage you to share with your friends and family. We ask that no food or dink is taken into the game room. Feel free to try some of our delicious food and drink either before or after your game experience. CAN YOU ACCOMODATE LARGE PARTIES OR CORPORATE EVENTS? Absolutely! We love hosting large parties and corporate events. We have a full-time team dedicated to helping coordinate all of the details for you. You can reach us by calling 915-585-9663 or by emailing us at: jradventurezone@gmail.com. Yes, we strongly recommend booking a reservation through the booking portal by clicking the Book Now button above. DO YOU OFFER A PIRATE PARTY PACKAGE? We certainly do. It’s basically a birthday party package including all the food, drinks, rides, and games that it usually would, as well as participation in Pirate Quest. On special request we can have our pirate show up to make your event even better. There will be a separate charge for the pirate himself. Our games are non-refundable. However, we can reschedule your game if you contact us at least 24 hours prior to your game start time. Please book your game online by clicking on the Book Now button above. HOW DO I BOOK AN ENTIRE ROOM? To book the entire room, you will need to purchase the maximum capacity for the room, which is 8 people. HOW DO I BOOK MULTIPLE PARTICIPANTS AT THE SAME TIME? Simply select the number of players when booking. All games are paid online at the time of booking, or you can register for walk-in (Not recommended). Each game is designed for one hour of intense fun! Plan to spend 15 minutes prior to each game preparing and briefing for your mission and 15 minutes after each game to debrief and take photos. The cost is $20 per person plus tax. IS PIRATE QUEST WHEELCHAIR ACCESSIBLE? Yes, it is, and we have a round bench in the room for those who don’t want to stand for the entire experience. We recommend our games for ages 13 and up. 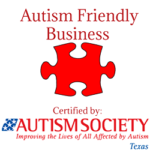 Participants under 14 are required to have an adult, 18 or older, participant to be with them. Also, any participants under the age of 18 will need an adult to sign their waiver. As this is at Adventure Zone, you will find great food including our world famous tacos, pizza, burgers, beer and wine. You will have our state of the art video arcade, as well as golf, go karts, and bumper boats too. Unless you book he entire room, you may be paired with other players. 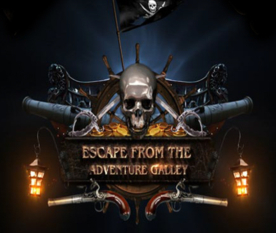 WHAT IS PIRATE QUEST-THE ESCAPE FROM THE ADVENTURE GALLEY? You have probably spent countless hours in front of a screen watching a hero save he world, solve a mystery, and save the world. Now it’s your turn to step into the game and escape from ordinary life, and to put on your pirate side for a bit. Here’s how it works. You and your team and locked in a room and have one hour to complete your mission and escape. Escaping will require teamwork, quick thinking, determination, and a sense of urgency! From the moment you step into your game, you’ll be totally immersed in our world. Saturday and Sunday – Escape Room open all day, walk ins OK.